Unique Design and a Test Button too! This Heart Alarm is attractive to look at and easy in the hand, this personal alarm is going to be exactly what our younger female customers have been requesting for some time and because of its natural good looks, it appeals to the biggest of kids too! A discreet alarm for women that may be fitted to a handbag and will look like a handbag charm but has the output to keep you safe. Girlie design ideal for teenage girls and women and because it is an unobtrusive 'charm' design it will encourage a young woman to carry it with her at all times. To activate the alarm, remove the pin attached to the keyring. To deactivate, simply replace pin. Batteries are supplied and fitted, and replacements are available at many high street retailers. The most obvious (but often forgotten) factor about owning a personal alarm is that you need to have it available for immediate use at any time when you may feel vulnerable. For example, walking late at night, walking back to your car in a deserted car park etc - the alarm needs to be held in your hand so that if you are approached, you can quickly activate it rather than rummaging around in the bottom of your handbag. Of course, if fitted to the zip of your bag, it is always instantly accessible. Remember - personal alarms are designed to shock the attacker, as opposed to necessarily attract passers by. This alarm is attractive and easy to use and ideal for the younger female user and a lot of the older ones too because of its appealing design. 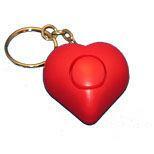 This can be fitted to a handbag and to all outward appearances looks like a handbag charm. However this handbag charm has the ability too keep you safe. An attractive unobtrusive personal attack alarm with a nice girlie design that will encourage all teenage girls and women to carry it with them at all times. To activate the alarm, remove the pin attached to the key-ring. To deactivate, simply replace pin. Batteries are supplied and fitted but we have replacements available. The Personal Attack Alarm needs to be carried on your person and be available at all times for immediate use whenever you feel you are in a threatening and vulnerable situation. Situations such as walking at night in unlit or dimly lit streets, walking back to a car park. The alarm need to be held in your hand so that if you are approached, you can quickly activate it rather than fumbling in your handbag or pocket. It will also be easily accessible if fitted to the zip of your handbag. Please remember that personal attack alarms are designed to temporarily shock the attacker to offset the balance of power and give you the opportunity to get away. The 128 decibel siren alarm may attract a passer-by and you may have the good fortune of that passer-by coming to your aid but do not rely on it. As soon as that alarm goes off get away from the scene as quickly as possible.